Color can turn a bland backyard into an outdoor oasis. A creative combination of hues can cleverly transform a space into an inviting haven for entertaining, dining and relaxing. “With an endless array of options in furnishings, finishes and accessories, homeowners have become more sophisticated and comfortable using color in their outdoor space,” says color maven Kate Smith, an expert in color for the home. Look around. 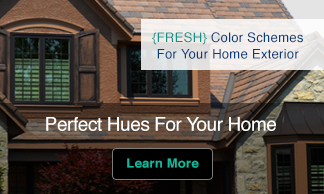 Stand in your outdoor space and look around at the colors of your home’s exterior and surrounding property. Make note of the existing walls, pavement, water, flowers, and landscape. Incorporating the color and style of these elements into your plan right from the start is a jumping off point for your creative vision and ensures that the final design has a sense of place. Extend the indoors out. Creating a harmonious color scheme is a great way to simultaneously connect your indoors out and can make an individual statement. 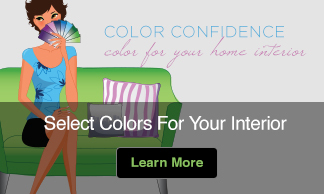 You probably think about how color flows from one room into another within your home. But what about your outdoor space? By coordinating your outdoor area with the adjoining indoor rooms you create a seamless transition between the indoors and outdoors, which can extend the interior spaces and make them seem larger. Let the sunshine in…Or should you? Pay attention to the intensity of the sun. A shady space can handle a quieter more serene palette, while a patio with full sun may need brighter colors to come alive. Make it pop. What’s the best way to brighten up the backyard? Do you match the brick/siding/retaining walls or contrast them? Should you stay with one color or create complementary looks? Unless you are going for a very playful or whimsical look, limit your palette to two to three colors. Choosing one main color in a variety of shades along with one or two accent colors is the easiest way to create a great look. If you want to make a statement, use bolder colors as accents, which can make even traditional pieces seem unique and fresh. In the mood. Think about the mood you want to create. Do you enjoy the intimacy of entertaining with friends, or are you looking for a colorful space that your children will enjoy? Your color palette can set the tone for how your space is defined, whether you want to relax, entertain, dine or play. Neutrals and metallics add glamour and a feeling of luxury ideal for an “adult” themed space. Hues such as oranges and other upbeat brights work for a family gathering where kids play. Get creative with eye-popping seating. Today’s outdoor furniture designs are not only comfortable, but follow fashion and come in colors from turquoise to orange to black. Modern wicker, for example, features a host of shades and finishes that can offer a vibrant look to a ho-hum area. Pair this with gorgeous cushions and pillows in an eye-catching pattern to create a comfortable and chic space. Cushy comfort. Almost all types of outdoor furnishings — wicker, wood, and metal — need a layer of cushion comfort. All-weather outdoor furniture cushions give your space an instant color makeover. Cozy, stylish and able to stand up to environmental elements, cushions can be custom upholstered to colorfully coordinate with the rest of your space. Infuse color with accessories. If you have a plethora of plants and flowers, they will add color to your decorating scheme. If you are starting from scratch, consider accessories that will give you a pop of color. Lay an artsy outdoor rug to define a seating area. Add colorful pillows to chairs or for lounging on the floor. Place cut flowers or artificial greenery in terra cotta urns and planters. Hang colorful outdoor artwork on a wall. If your space is covered by an awning or pergola, hang long drapes of weather-resistant fabric to make it feel like a room. Coordinate neutral or colorful fabric patio table or floor lamps, which come in a bevy of shapes, sizes, styles and colors. And don’t forget the frame. Furniture frames have gone from boring to va-va-voom. They now come in a variety of stylish and colorful looks and easily coordinate with any fabric color you choose. This article was written for a fabulous e-book from Home Infatuation that teaches You How To “Live Beautifully…Outdoors”.